January 2, 2014 by Ken Ward Jr. 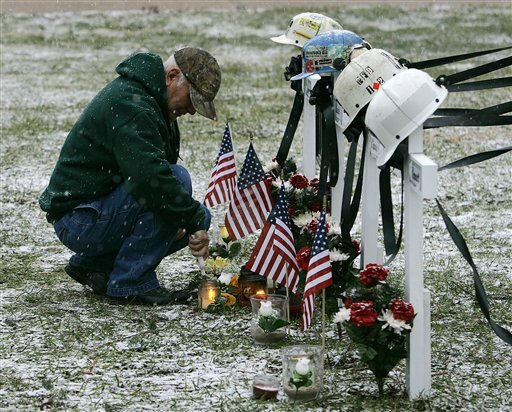 It was 8 years ago this morning that an explosion ripped through International Coal Group’s Sago Mine in Upshur County, W.Va. Twelve miners died and another barely got out alive. Investigators said the deaths were avoidable, and a report by Davitt McAteer’s team had plenty of blame to spread around. Thank you for continuing to remember each miner by name. It’s hard to believe that it has been 8 years since the Sago Disaster. Unfortunately, then-Governor Manchin’s promises that West Virginia would become the worldwide leader in mine safety and would have the safest mines in the nation has gone unfulfilled. Manchin made similar promises after the Massey (Upper Big Branch) Disaster in April, 2010, which likewise ring hollow today. In fact, West Virginia continues to lead the nation in mining deaths almost every year and there have been no meaningful improvements in mine safety laws on the state or federal level since the Massey Disaster. Sadly, Senator Byrd’s words were prophetic.